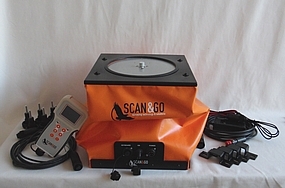 Scan & Go - Solvotek Mühendislik ve Bilişim Hizmetleri Tic. Ltd. Şti. 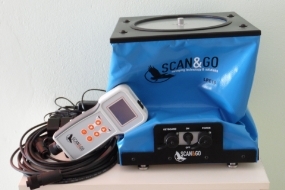 Scan & Go - Solvotek Mühendislik ve Bilişim Hizmetleri Tic. Ltd. Şti. 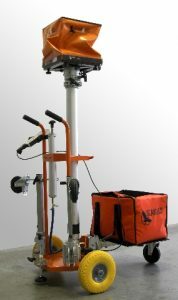 The complete system for high definition 3D topographic survey is made with a laser scanner sensor combined with two GPS receivers and a reference target, all installed on a motor vehicle or on a pneumatic pole to allow easy movement between the measurement sessions and ensure greater “reach” measurement because of the height from the ground of the laser sensor position. 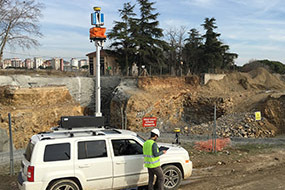 The methodology for Scan&Go survey was born from the need to make more productive the quick the use of new terrestrial laser scanner systems in the field of traditional survey and to motivate the transition from point to point survey to the method of three dimensional virtual reality allowing daily use even in classical topography. Level-Plane Evo 16 is a system planned for authomatic levelling to ensure total verticality of the equipment with accuracy of +/- 30” (or +/-3” with manual control) in all vehicle inclination conditions. System composed of an extensible and folding pneumatic pole installed on vehicles for Level-Plane Evo lifting. Maximun height of 3.00 meters.